Cigars have a strange place in the American psyche. 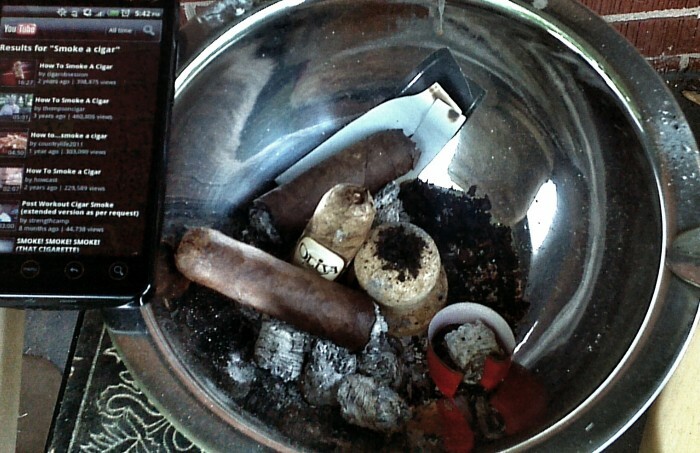 When most of us think of cigars, I imagine we have an almost cartoonish image in our minds of Wall Street Fat Cats lighting them with $100 bills they bilked from unsuspecting old ladies; Third World dictators smoking them as they review their troops; or American G.I.s chewing on a stub as they top a jungle hill. The best image we might conjure up is a proud Papa handing out cigars to all his friends after the birth of his child. Cigars aren’t something “ordinary” people engage in; they’re displays of power, and learning how to properly smoke one seems to come from a secret indoctrination. I imagine most people learn to smoke cigars from someone else. You bankrupt your first retirement fund, and the CEO of your company comes to your desk, calls you “son”, takes you into a darkly paneled private club, pours you a scotch, and teaches you how to develop your evil laugh and properly light a cigar. Aside from Gene Hackman setting Peter Boyle on fire in Young Frankenstein, you never see anyone actually teaching someone to smoke a cigar. Coming from a family of smokers, I was really proud of the fact that I avoided that habit for over 40 years. However, like Adam by Eve, one day I found myself corrupted by my girlfriend. She was going to a girls’ night out where they planned to smoke cigars, and she wanted to practice during the weeks beforehand. I agreed to try it, too. (No snakes were involved, but there was a particularly devilish Chihuahua present.) Being about as far from any seat of power as one can possibly get, we turned to the font of all geek knowledge: YouTube. We spent hours on YouTube researching the right equipment, evaluating various techniques, comparing our accumulated myths to the reality: how much of the end to cut off? how do you light it? do you inhale? will it give us cancer!?!?! Through diligent hours we watched videos produced by older guys with a military look sitting in their garages, cigar makers in their warehouses, and at least one guy in a darkly-paneled room of a private club. We hit most of the stereotypes, so I feel we did our due diligence. Through it all we discovered you cut a small bit of the cap off the head of the cigar, lightly toast the foot before fully lighting it, draw the smoke into your mouth (but don’t inhale it into your lungs,) and yes, it can still give you some types of oral cancer. Yes, YouTube had prepared us, and so one night, in lawn chairs in the front yard, we put our knowledge into practice. One of us didn’t cut enough off the head; the other cut too much; neither of us could keep the thing lit; and I forgot the rule about not inhaling at least three times. All in all, it was a smashing success. We both loved the experiment, which lead to even more questions for YouTube: how do you keep this thing lit? what kind of lighter should we use? for the love of god, how do we get rid of this nasty taste the next morning!?!?! We’ve since moved into the real world with our questions, finding several really great cigar shops with staff that are helpful to newbies. But still, any time we have a random question while in the middle of a smoke, out comes the smartphone with YouTube just a click away.